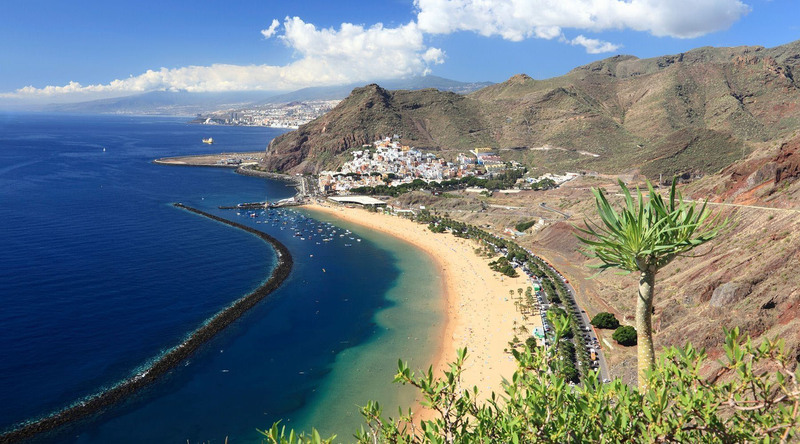 A notoriously festive destination, Tenerife is the biggest, most well-known of Spain's Canary Islands, located in the Atlantic Ocean off the coast of Africa. The volcanic island is characterized by rugged, steep coastline and miles of beaches, popular for kite surfing and swimming. Teide-Pico Viejo, Spain’s tallest peak, towers over the island, and its national park is a UNESCO World Heritage Site. Explore Santa Cruz and the very modern Auditorio de Tenerife, reminiscent of Australia’s Sydney Opera House. Loro Parque boasts the world’s largest collection of parrots, and you can’t miss the striking bell tower of the Iglesia de Nuestra Señora de la Concepción, the city’s oldest church. Learn about the island’s ancient inhabitants at the archaeological sites of Guanches or explore the mysterious step pyramids at Güímar. When you need a break, Tenerife also has an abundant variety of fresh fish, well-known cheeses, and renowned wines to savor. Travel by cable car to the top of Spain’s highest peak, Mount Teide, where, on a clear day, you can see the other Canary Islands and even the coast of North Africa. The rugged and beautiful landscape is the result of millions of years of volcanic activity. The second largest town in Tenerife, La Laguna, is also considered the cultural capital of the island. Points of interest here include the Cathedral of La Laguna, Iglesia de Nuestra Senora de la Concepcion, and the town centre, Plaza del Adalentado. One of the better preserved towns in Tenerife, La Orotava features stately mansions, historic churches and quaint cobblestone streets. Situated at an elevation of approximately 1,300 feet, the town is an excellent vantage point for sweeping views of the famous Orotava Valley. Venture through pine forests and rich vegetation on an archeological expedition that explores the mysteries surrounding the ancient Pyramids of Guimar. Climb into a rugged machine for a rumbling journey through the paved roads inside the forests of Tenerife and into the lunar landscape of its lava fields. Embark on a narrated stroll through the historic streets of Santa Cruz that includes two stops to share a selection of local dishes.